The new Fayette Memorial Hospital surgery room was open to the Hospital Auxiliary to view on their meeting date. Chelsie Hornsby, director of business development/marketing & foundation, and Mary Dye, clinical staff coordinator, gave the group a tour of the new unit. Shown are Ms. Hornsby, Sonja Seiler, Maxine Wolf, Joyce Lott, Sharon Irons, Ms. Dye, Suzanne Kidd, Vicki Cardenas and Ann Blake. There will be an open house Feb. 21 at 4:45 p.m., which is open to the public. 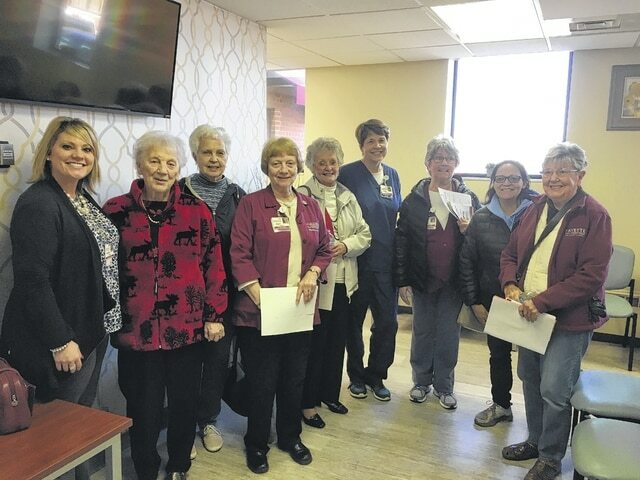 Fayette County Memorial Hospital Auxiliary Vice President Carolyn Reinwald opened the meeting due to the absence of the current president Pat Gall at the Feb. 13 meeting. Carolyn became president for 2017-18 at the meeting and was presented a president’s pin from Nancy Troutman, hospital staff and auxiliary advisor. Carolyn announced there was a new volunteer member, Jeannie Rivers. Mike Diener, hospital CEO, emphasized how well things are going in the hospital and how the hospital is committed to excellence and accountability. New goals are being implemented in the areas of people, service, finance, quality, growth and community. Jane Bissell, hospital CFO, informed the group that the new surgery unit was scheduled to open Feb. 14. There will be an open house Feb. 21 at 4:45 pm. It is open to the public. Diener said the hospital had 486 more patient days in 2016 than they had in 2015. Chelsie Hornsby, director of business development/marketing & foundation, explained to the group that the next effort will be to earn money to remodel the emergency room. The plan is to get a consulting group to help earn money for the Foundation for ER. Another goal is to form groups for those people with cancer. The president thanked the speakers for coming and introduced Nancy Troutman, who explained the 2017 Membership Handbooks and the Revised Bylaws Booklet. The new president opened the business meeting. Jeanne Immell read the minutes. Sherry Ferguson gave the treasurer’s report. The bazaar profit went up nearly $2,000. Everyone was so pleased. The auditing committee, consisting of Ruth Curry, Karma Breedlove and Beth Foster, reported that they had audited the books and they were perfect. Jean Ann Davis gave her report on the gift shop. Each member had a copy of the transactions made for several months during the period of Nov. 8, 2016 to Feb. 13, 2017. There have been many new items added and sales made. The report was approved as given. The scholarship committee, which consists of Barbara Vance, Jody Hanawalt and Joyce Lott, reported that they had taken the applications for the scholarships to the schools and they will be handed out and decided soon. https://www.recordherald.com/wp-content/uploads/sites/27/2017/02/web1_IMG_2429.jpgThe new Fayette Memorial Hospital surgery room was open to the Hospital Auxiliary to view on their meeting date. Chelsie Hornsby, director of business development/marketing & foundation, and Mary Dye, clinical staff coordinator, gave the group a tour of the new unit. Shown are Ms. Hornsby, Sonja Seiler, Maxine Wolf, Joyce Lott, Sharon Irons, Ms. Dye, Suzanne Kidd, Vicki Cardenas and Ann Blake. There will be an open house Feb. 21 at 4:45 p.m., which is open to the public.